Having mastered comic books and gag cartoons, in 1958 Jack Cole set his sights on the cartoonist's pot of gold—a syndicated newspaper strip. 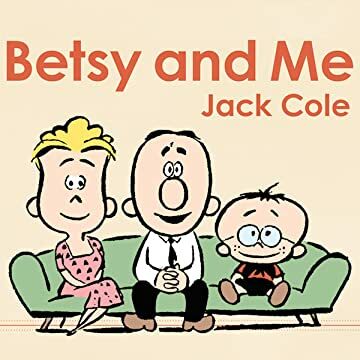 He hit the bull's-eye with Betsy and Me, a breezy domestic farce focusing on a middle-class urban couple and their smart-aleck genius son. Betsy and Me was an instant success and newpapers were lining up to buy it. Then, with only two-and-a-half month's worth of strips completed, Cole purchased a .22 caliber pistol and ended his life. 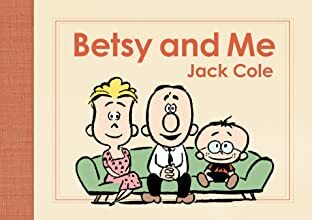 For Betsy and Me, featuring city dweller Chet Tibbit's day-to-day stuggles and achievements, Cole stripped his style down to its bare essentials, creating a strip that sparkles with economy, wit, and charm. What gave the strip its edge, however, was Cole's innovative storytelling. As R.C. Harvey writes in his introduction, "Cole's storytelling manner was unique: the comedy arose from the pictures' contradicting the narrative prose. Cole's fatuous protagonist and narrator would say one thing in the captions accompanying the drawings, but the pictures of his actions showed the opposite, revealing [him] to be a trifle pretentious and wholly delusional." Harvey's intro also serves as a biographical sketch and sheds light on the circumstances surrounding Cole's suicide.